How do I buy a N-Hance Franchise? NHance is the fastest growing wood refinishing franchise in the United States, and it's proven business model continues to be one of the easiest to run and scale. To buy an NHance requires a total investment between $49,913-$153,179. NHance provides it's franchisees with full suite of marketing tools, comprehensive training (in person and at NHance University), ongoing guidance and support (business coaches, monthly check-in's). OWN A TOP-RANKED WOOD REFINISHING FRANCHISE. 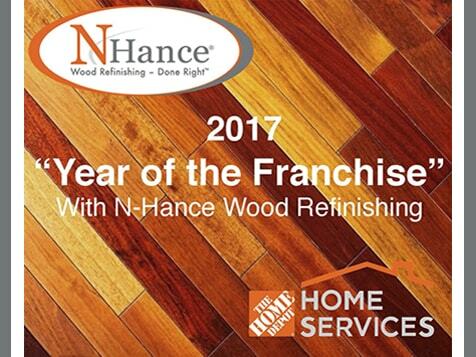 N-Hance has taken the wood refinishing industry by storm - get in on the action and become your own boss today! N-Hance Wood Refinishing is revolutionizing the $361 billion home restoration industry by offering fast, affordable and beautiful solutions to refinish cabinets, hardwood floors, doors and other wood surfaces. Founded in 2001 by the same company that launched Chem-Dry into the world's largest carpet cleaning franchise, N-Hance has skyrocketed to prominence with over 500 locations across the country. Our proven business model was named as the “Top Franchise Opportunity” in our category by Entrepreneur magazine in 2018, and we’re not slowing down anytime soon - N-Hance is poised to grow for decades to come. Open N-Hance in any of these available states: AK, AL, AR, AZ, CA, CO, CT, DC, DE, FL, GA, IA, ID, IL, IN, KS, KY, LA, MA, MD, ME, MI, MN, MO, MS, MT, NC, ND, NE, NH, NJ, NM, NV, NY, OH, OK, OR, PA, RI, SC, SD, TN, TX, UT, VA, VT, WA, WI, WV, WY. Why is Now a Great Time to Invest in N-Hance? N-Hance is capturing a significant share of the booming home remodeling industry! The demand for affordable wood refinishing is booming. 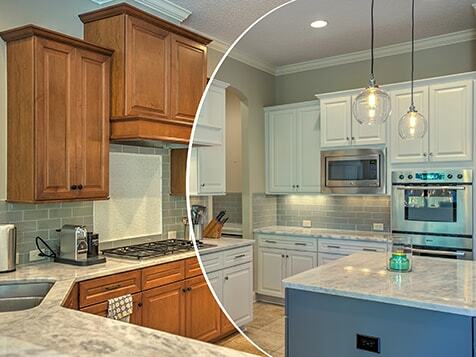 According to The Atlantic, there are roughly 135 million homes in America, and 26% of those surveyed planned some level of kitchen remodel this year, which means that there are a lot of homes that need the N-Hance experience. The growing economy has placed Americans in a position where they have money to devote to making improvements to the places they share with their loved ones. What are the top reasons to invest in an N-Hance franchise? What makes N-Hance a top-rated franchise opportunity? Low-investment, home-based business - The total investment to begin operations starts at $62,212, and N-Hance offers aggressive in-house financing for qualified candidates. Potential for high returns - Our average job size is more than $3,500 and we’re pleased to share that our top quartile of franchisees average $604,160* annually. N-Hance floors the competition - We are the gold standard for wood refinishing in the booming $361 billion home improvement industry. N-Hance is a forward-thinking, 21st-century brand - We’ve made significant investments in patented technology and in proprietary products and processes that allow us to complete jobs in hours instead of days. N-Hance is Gaining Brand Equity - We recently celebrated the one-year anniversary of our Brand Marketing Fund, which runs commercials on DIRECTV and cable on stations including HGTV, DIY, Food Network, Cooking Channel, Travel Channel, TLC, Destination Country, Bloomberg, CNBC, CNN, Fox Business, Fox News, Headline News, MSNBC and The Weather Channel. Exclusive relationship with Home Depot - We are partners with the leading home improvement store chain in the country and N-Hance is in the chain’s top 5% of highest-performing vendors. Get in on the action and start your N-Hance franchise today! N-Hance, is far more interested in recruiting great people who are enthusiastic about owning a business than they are in finding people with lots of cash to spend. For this reason, we offer in-house financing and have some of the lowest start-up costs in the industry. *According to our most recent Franchise Disclosure Document.